Photo nbcnews.com A series of at least 145 wildfires in Portugal are now burning out of control as the death toll soars to 27 with 50 more injured in what is being called the worst Portugal's worst day of the year for forest fires caused by incredible 36 deg C,100 deg F temperatures from Hurricane Ophelia. A spokeswoman for the agency told reporters that firefighters were still tackling 145 separate fires, 32 of which were serious. 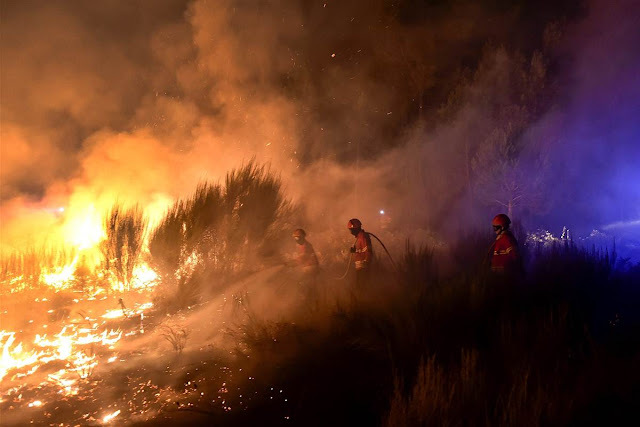 "We can confirm the deaths of 27 people in the districts of Coimbra, Castelo Branco, Viseu and Guarda," AFP quoted Patricia Gaspar as saying.